This is one of a set of walks in the Isle of Dogs. It begins at Island Gardens DLR station, follows the Riverside Walk (great views across the Thames) and ends at South Quay DLR. There is also a detour to Mudchute Fam where you can pat a pig while admiring the not-so-distant backdrop of the modern business centre at Canary Wharf. The prospect from Island Gardens across to the Old Royal Naval College is world renowned – Canaletto painted the scene in 1752. 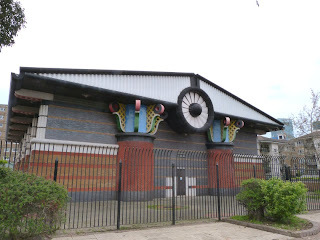 To see it, after emerging from the Island Gardens DLR station, cross Manchester Road, go down Douglas Path, cross Saunders Ness Road, then turn left at the domed building which is the entrance to the Greenwich Foot Tunnel. (If you’re feeling adventurous you can start the whole route from Cutty Sark Maritime Greenwich DLR station using the Foot Tunnel, the south entrance to which is situated near the pier.) Once at the river you can see the restored Cutty Sark and imagine the scene when sailing ships crowded the Thames. To the east is the Trafalgar Tavern. A little further are the Trinity Hospital almshouses, dwarfed by the London Transport power station. For details of all these go to the Greenwich entry. Continue along the Riverside Walk as it bends to the left. You will pass the brick apartments of Cumberland Mills Square that have a comfortably jumbled appearance (a list of the architects involved in the new developments can be found via the link below). The way then goes in a long curve until you get to Newcastle Drawdock which was constructed as part of master builder William Cubitt's development of the area in the 1840's. Streets of housing for workers appeared, and the foreshore was leased out to a variety of industries such as ship repairers and cement manufacturers. The stones you see on the eastern wall come from a chapel destroyed in WW2 - a fate also suffered by most of the housing nearby. 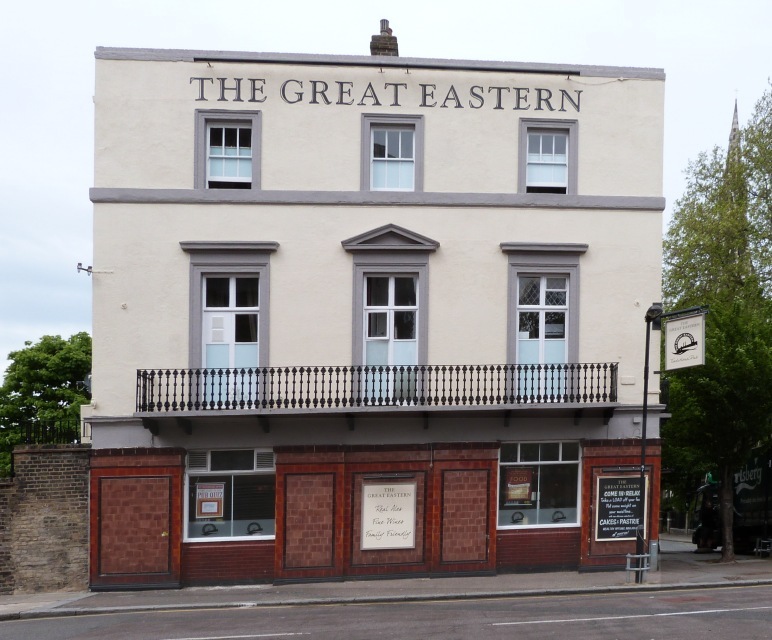 Just behind the dock, on the corner of Glenaffric Avenue, is the Great Eastern pub (previously the Waterman’s Arms, popular with socialites and celebrities in the 1960’s/70’s.) Opposite the pub is Christ Church. The vicarage next to it (in Manchester Road) was built and given to the community in the 1850’s by Cubitt. These buildings form one of the few remaining clusters of buildings from the 'old' Isle of Dogs. To get to the 32 acre City farm from here takes about ten minutes. Go past the pub down Glenaffric Avenue and cross Manchester Road. Go to the right until you get to Seyssel Street. Go left here and then cut through the gardens of Urmston House flats. The entrance to the farm is immediately on the left in Pier Street. 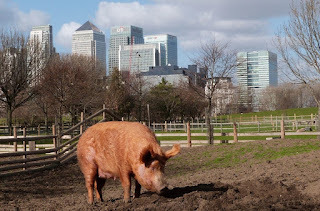 There are all kinds of farm animals and poultry around – in spring you can watch the lambs cavorting in their enclosure and there are always happily muddy pigs lolling about. (Nothing can loll quite so well as a massive Gloucester Old Spot.) The northernwest outlook from the farm is mind-numbing, as you can see across the fields to the Canary Wharf business centre while in the foreground are cattle, sheep or pigs! If you do not wish to continue my Rambles trail, instead of going back to Island Gardens DLR you could follow the route through the fields to Coldharbour DLR as suggested in the farm’s website. However, although the path is surfaced, the exit itself is not step-free and involves a rather horrid trek through a car park. To get back to the Riverside Walk go back to Pier Street and then left towards Manchester Road. Cross this with care and go left. Pass the first turning for Amsterdam Road, but take the second (opposite a primary school). If you are not going to the farm, return to the Riverside Walk. 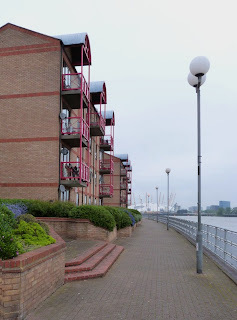 The housing you pass on the next stretch is fairly straightforward late twentieth-century, but where the path broadens out there is a colourful block with red balconies (Caledonian Wharf). 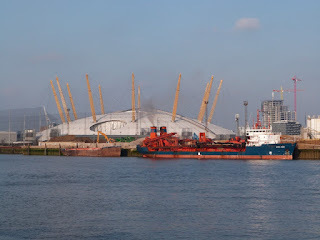 As you make your way further northeast the O2 dome comes into view over the Thames and you may begin to hear noise from the aggregates business nearby - one of the last industries left on the North Greenwich Peninsula. You can also see a large gas holder over the river, rather beautiful in its own way. Cubitt Town Wharf comes next, where you will see an warehouse converted into flats. Walk round the back of this, through a car park whose walls are the remnants of another industrial building. Soon you are back at the river. More brick housing, with a pretty communal garden glimpsed through railings. Now comes the delightful Compass Point village, built on Dudgeon’s Wharf, once occupied by marine engineers. The Dutch/Jacobean style on the river front is particularly attractive. On one of the white piers on the river wall at Sextant Avenue is a memorial to the six people who in 1969 lost their lives dealing with a fire in redundant oil tanks, a reminder of what a miserable, run-down area this was at that time. Continue along the riverside under two wisteria-clad pergolas. At Millennium Wharf the buildings are somewhat plainer. Next to them is a row of single-storey warehouses (1902), now desirable living accommodation. Opposite is an old jetty. Further along is a large stepped sandy inlet. Walk round this. The gardens of London Yard that come right down to the path make this a pleasantly green area. Take the wide path with railings past a tower block – the next stretch is mostly public housing - and a small park area. At the end of the promenade the path dips and narrows, passing a variety of low-rise flats and maisonettes. At the moment (2019) you will have to leave the river, as development is taking place. Make your way through a social housing estate, turning turn right at Tulia House to get to Manchester Road. A few minutes walk will bring you to the Cubitt Town Youth Project (opposite the Island Medical Centre). From River Barge Close you can pick up the river path and refer to my original directions, following a brick alley away from the river. As it turns right you will see a brightly coloured building (John Outram 1988) you might think is an oriental temple of some kind. Not so! It may be in a place called Folly Wall (unmarked), but the ‘temple’ has a serious purpose – to stop storm water from causing flooding. To see the river facade, go through the iron gates* and turn left. Go back, walk down Folly Wall and turn right into Stewart Street. Pass the front of the pumping station (it's almost identical to the riverside aspect) and go over the road to get to a grassy area (Samuda Estate). At the end of this you will be in Manchester Road. Cross over by the zebra, go right, then cross East Ferry Road. Walk a few steps to the right to get to Marsh Wall. Go down to the traffic lights and cross there. (The roads round here are tricky to negotiate, so please take care.) Walk to the left and then turn into Lawn House Close to reach West India South Dock. This area is covered in Route D (Northeast). Continue along the dock until you reach an inlet where there are steps (or a slope) up to Marsh Wall. Cross over the road and turn right to get to South Quay DLR station escalators and lift. Should you wish to carry on to Canary Wharf, take the second (western) flight of steps (or the easy access slope further on) back down to dock level and walk straight ahead. Go round the corner and along the dockside where quite large boats are often berthed. Soon there is a row of restaurants with a pleasant narrow path lined with hanging baskets. Pass along this to reach the gracefully curving (slightly bouncy) South Quay Footbridge. Once over the bridge, go down the steps (or take lift), then pass through two sets of glass doors, crossing a large atrium. Turn left and cross at the lights – you are now at Canary Wharf. For details of the walk in this area click here. *If the Riverside Walk gates are closed at this point, turn left down Folly Wall and walk to Stewart Street. You can see the front of the pumping station from here. Continue going to the right to pick up the route above. This is just one walk from the many to be found at London Tube Rambles. There are architectural gems, beautiful country views, historic places and quirky buildings even in the most unpromising areas covered by the outer London Underground stations. Usually the discoveries are within a mile of the Tube or DLR - often only five minutes walk away. If you reached this as an individual page via a search engine, you might like to click on the above link and see the other destinations explored. You'll be amazed at what's out there!